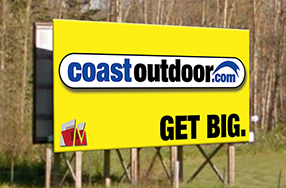 Coast Outdoor billboard locations near the city of Prince George, BC are divided into four areas. Prince George north billboard locations are on Highway 97 (John Hart Highway), north of Prince George on a major traffic route into Prince George. Prince George south billboard locations are on Highway 97 (Cariboo Highway), south of Prince George on a major traffic route into and out of Prince George. Prince George east billboards are located on Highway 16 (Yellowhead Highway), east of Prince George on a major traffic route into Prince George. Prince George west billboard locations are on Highway 16 (Yellowhead Highway), west of Prince George on a major traffic route into Prince George.